Though these are of a compact folding style, full size and even Doorman and Golf Umbrellas could hang here. This Iron Pipe Bar Merchandiser for Umbrellas works well for all, and even alternate merchandise. Well-worn and repainted, this very basic and possibly hand-built outfitting has stood the test of time. 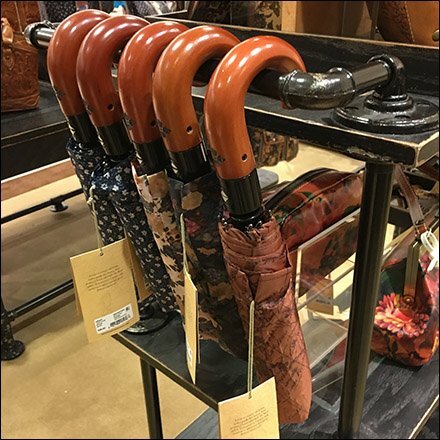 This Iron Pipe Bar Merchandiser for Umbrellas seen at Macy’s, Short Hills Mall, Chatham NJ. “Umbrella Merchandising Fixtures Pinterest Board“.